Rapha Systems of Austria is a leading supplier of innovative building products. Rapha stone is their latest creation, a real stone veneer made from splittable slate rocks. Thin layers of approximately 0.1 to 2.0 mm are separated from big, random sized rock sheets. A polyester resin and glass fibre resin bond the veneer layers together. The rough split surfaces and the ever changing colour variations in each layer make each leaf a unique piece and a treat for the senses. The ability to process this stone veneer with standard woodworking tools means unlimited possibilities for the shopfitting, joinery and furniture industries. It's flexibility means it can be used and processed like most other thin veneer or laminate products; with the assistance of heat (between 65-85 degrees celsius) even tighter radii can be achieved. 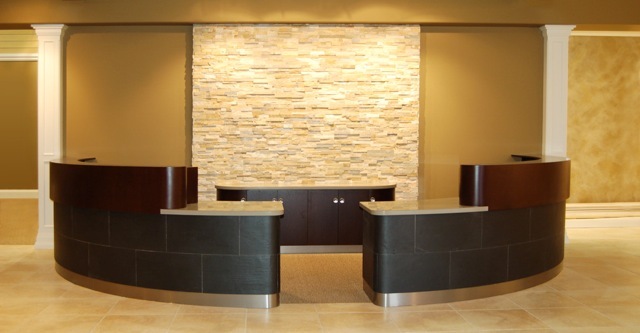 Coupled with the significantly reduced cost and weight versus traditional stone products, the luxury of real stone for most applications now becomes a reality. See below some examples of Rapha stone in use, or click on the 'Rapha Gallery' link above to see the full range.